The circus arrives without warning. No announcements precede it. It is simply there, when yesterday it was not. Within the black-and-white striped canvas tents is an utterly unique experience full of breathtaking amazements. It is called "Le Cirque des Reves," and it is only open at night. But behind the scenes, a fierce competition is underway--a duel between two young magicians, Celia and Marco, who have been trained since childhood expressly for this purpose by their mercurial instructors. Unbeknownst to them, this is a game in which only one can be left standing, and the circus is but the stage for a remarkable battle of imagination and will. Despite themselves, however, Celia and Marco tumble headfirst into love - a deep, magical love that makes the lights flicker and the room grow warm whenever they so much as brush hands. I have mixed opinions about this book. I did really enjoy it but I didn't manage to get into the plot and characters as quickly as I was hoping. I heard a lot about it and saw many 5 star reviews so I picked it up but I don't think it was as good as everyone said. So, to get the bad things out of the way, I found it a little slow. I got into it straight away at the beginning and I sped through the ending but the middle, I found, was quite boring. Not much happened and I think it took a while to get down to business with everything. Secondly, I think I would have enjoyed this if I had read it when I was younger. It's probably aimed at more of a younger audience (12-15year olds probably) and I found a lot of the stuff to not interest me as much. Although I really love fantasy, this didn't meet my expectations. Anyway, onto the better parts. I really liked the creativity that went into this novel. 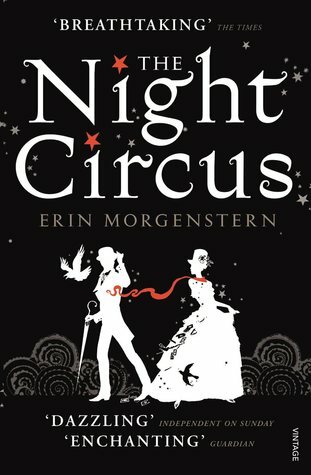 The details about the circus were really believable and I loved the style of writing. All the characters were really well designed and the overall plot was fantastic. My favourite part was probably the ending. It had a nice twist to it and it matched the fairy-take-esk genre of the novel with everyone living happily ever after. I also liked how it came back around in a full circle. It was really well written by the author.